MH & RV Park Today! We're side-by-side sister parks, so we can accommodate your every need. 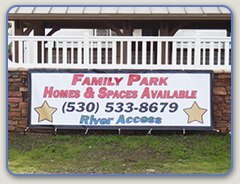 Golden Feather Mobile Home Park and adjacent River One RV Park are located in the ideal spot for lovers of the great outdoors. Looking for the perfect place for your mobile home or to buy one of ours? Your search is over! We offer full hook-up RV spaces too. Come join our welcoming community today! Fully landscaped and surrounded by wildlife preserve and forest land, Golden Feather is a family-friendly nature lover’s paradise. Our cozy Northern California Mobile Home Park is a perfect vacation destination or year-round home. Visit us for a month... or move in! 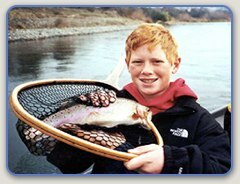 Thanks to the local hatchery, the Feather River is consistently one of the best fisheries along the West Coast. 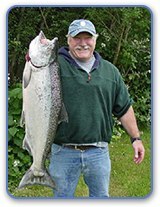 Massive runs of Salmon, Steelhead, Rainbow Trout & Shad provide phenomenal year-round fishing opportunities. Known as one of the Best Bass Lakes in California, nearby Lake Oroville plays host to several bass tournaments throughout the year. But Lake Oroville isn't just for the pros. Everybody has a good time fishing here! The marina rents all sizes of fishing boats, and bait & tackle supplies are available right here at the Golden Feather Marketplace. Whether you already own a mobile home and are looking for the ideal location for it, or want to buy one of our mobile homes, Golden Feather MHP is the place to be. We offer financing for park-owned homes. Convenient to downtown Oroville, Golden Feather is centrally located near services and activities for every interest. These include cozy restaurants, quaint shops, grocery stores, gas and much more. Whether you're visiting Northern California for a month, for the season, or to settle in for good, you'll find us friendly, helpful and ready to make you feel right at home from the day you arrive. The City of Oroville is considered the gateway to the Lake Oroville and Feather River recreational areas. Oroville offers some of Butte County’s and Northern California's greatest recreational opportunities. Lake Oroville was created by the second largest earthen dam in the United States and offers sporting activities throughout the year, such as skiing, sailing, swimming, fishing, camping and picnicking. Under new ownership, with extensive upgrades and renovations, Golden Feather is a place you’ll be proud to call home. We offer a wide range of amenities including professional on-site management, mature landscaping, fenced pet area, new laundry facility, sheltered mailbox and school bus stop area and an on-site convenience store — Golden Feather Marketplace. 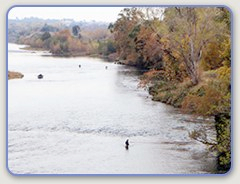 Convenient to downtown Oroville, CA, Golden Feather MHP’s lush property sits directly along the banks of the Feather River, where you’ll enjoy beautiful scenery and world-class fishing. We're also close to golf, wineries, shopping, museums and outdoor adventure activities to fit every interest. 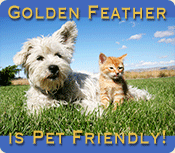 Golden Feather is also conveniently located near the Oroville campus of the Northwest Lineman College. As we're only a couple of miles away from campus, students who stay with us often carpool together and even come home for lunch. If you're planning to attend NLC, Golden Feather is the perfect place to stay. Whether you’re into wrestling salmon & steelhead, hiking through pristine forests, or just relaxing by the river, our Northern Sacramento Valley Mobile Home Park has it all. Golden Feather’s warm summers are perfect for enjoying the refreshing water of the Feather River or Lake Oroville, while our moderate winters will keep the snowbirds warm! Visitors to our Oroville, CA mobile home park will enjoy all sorts of year-round pastimes, blue sky, clean air and exciting activities to suit every interest. Visiting or moving to Oroville provides opportunities for fishing, hiking, biking or just relaxing in the beauty that abounds in our outdoor recreation paradise.